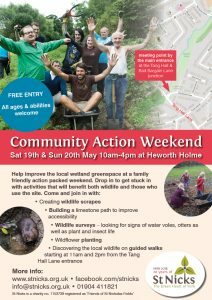 Join us at Heworth Holme for a family friendly action packed weekend improving the local wetland greenspace. Meet at our gazebo near the Tang Hall Lane/Bad Bargain Lane entrance to get stuck in with drop-in activities that will benefit both wildlife and those who use the site. These events are part of our York Becks Project and are funded thanks to Lord Mayor 2016-17’s fundraising. Free entry, donations welcome. No booking needed.